The town of Sagada in Mountain Province, Philippines is known for a lot of things. Thousands of tourists flock to the remote and sleepy town every year to look at its hanging coffins, go spelunking inside its various underground caves, walk along its rice terraces, climb its mountains that are thick with pine trees, and immerse themselves in the town's unique culture and traditions. 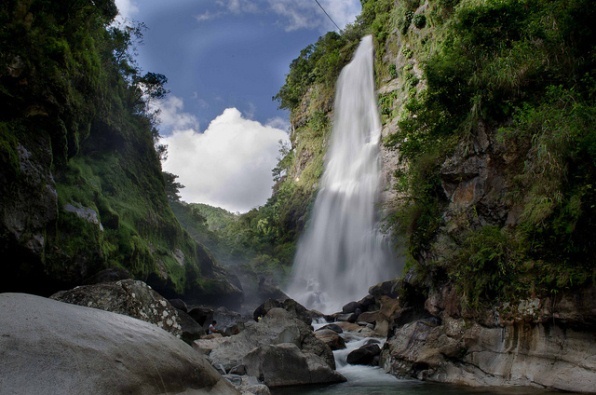 Sagada has become one of the favorite tourist destinations in the Philippines. It's a popular choice for local and foreign tourists alike. That said, if you are on a trip in the northern parts of the Philippines, don't forget to include Sagada in your itinerary. If you love adventure and nature-related activities, you are going to enjoy what Sagada has to offer. Now, Sagada has added another attraction, one that will surely entice more tourists to visit the town and this new attraction is its annual Etag Festival. The festival is now on its third year. For this year (2013), the festival will run from January 31 to February 4. That's five days of celebrations that include civic and street-dancing parades, musical concerts, indigenous games and sporting events. The two previous festivals had been very successful, significantly increasing the numbers of tourists visiting the town. The festival last year attracted about 40,000 visitors and participants. The festival really helps a lot in promoting the town as a tourist destination. The festival was named after the “etag” which is basically pork meat that has been preserved either by smoking or drying under the sun. Before the meat is smoked or left under the sun to dry, it's salted first. The preparation of etag is pretty simple. When a pig is butchered and the meat are cut into pieces/strips, these are then mixed with salt then left in a container overnight to allow the salt to seep into the meat. The next day, the strips of pork meat are then smoked or dried under the sun. Smoking or drying can take several days or even weeks. The dried meat are then stored in a container that can't be reached by flies or other insects that may cause damage to the preserved meat. A waterfall in the town of Sagada. Image credit: Jojo Nicdao via Flickr. The etag is a favorite delicacy among the people of the Cordillera region. The meat is usually boiled in water alongside other ingredients like dried beans and vegetables. It's also a very common ingredient for the indigenous dish called pinikpikan. If you are planning on attending the Etag Festival in Sagada, you need to travel there a day or two before the start of the festival. There are three main access points – Banaue, Baguio and Manila. If you are coming from Manila, travel time can take 12 to 15 hours. If you're coming from Baguio, it can take you 5 to 8 hours. From Banaue, travel time can take 3 to 4 hours. Furthermore, if you're coming from Manila, you can either take the Baguio route or the Banaue route. There are passenger jeeps and vans plying the Banaue-Sagada route. If you're taking the Baguio route, you will have to transfer to another bus in Baguio. The only bus company plying the Baguio-Sagada route is the Lizardo Trans or GL. The bus station is located at the Dangwa Station, just behind the Baguio Center Mall.